Continuing a tradition of more than 25 years, Spirals Gymnastics offers professional gymnastics instruction for girls and boys age 3—18. 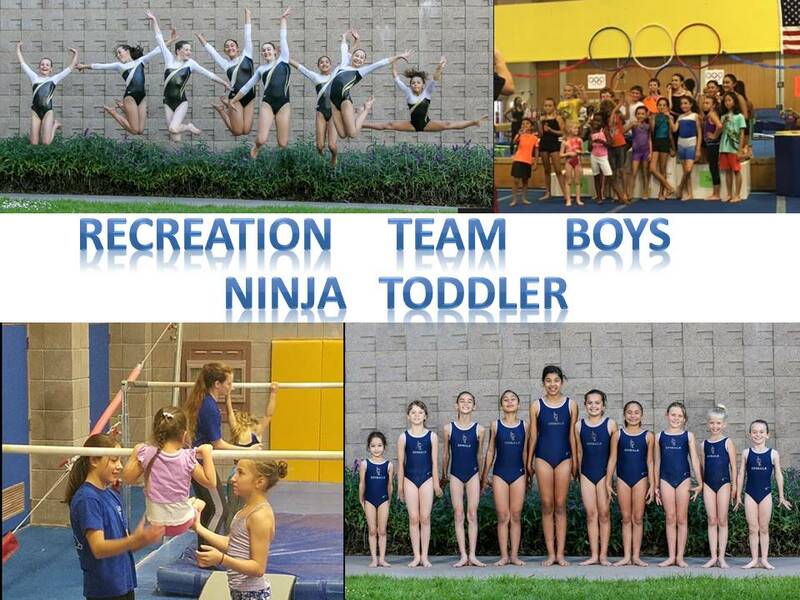 Our Preschool and Recreational classes focus on the love of gymnastics, fitness, and sport through progressive development of Olympics event skills. The Competitive Team is a fully comprehensive training program for girls level 2—10, that consistently produces Sectional, State, and Regional champions. Spirals Gymnastics is a registered 501 (c)(3) non-profit professional gymnastics school. All Instructors are required to hold a current USA Gymnastics Instructor certification on top of having a passion for the sport and a love of teaching children. No matter the ability or direction of your child, Spirals Gymnastics has an excellent class that will be just right for your family! Classes and training take place in the gymnastics facility behind the main gym at Robertson Gymnasium. Once at Robertson Gymnasium Do Not Enter Through The Main Foyer of the basketball gymnasium if you are there for a workout, dropping off, picking up, or just to visit. We do not want to interrupt any UCSB activities in the main gym. Walk around to the left and proceed down the long hallway inside the gymnasium building. At the end of the hallway go through two sets of double doors and the gymnastics facility and parent waiting area will be to your right. Alternatively, you may walk all the way around the left side of the building to the glass doors at the back of the building. or lot 27 or 29 - with a short walk to the gym. Note: You must pay for parking at all times. Holiday Closure 12/17 through 1/1! Just a reminder, Spirals will be closed for Rec classes Monday December 17 through Tuesday January 1st to give our staff time to visit family for the holidays. Classes will resume on Wednesday January 2nd. Have a safe and happy holidays! Spirals Performing in the Santa Barbara Holiday Parade Friday 12/7! See you all downtown at the 66th Annual Holiday Parade. We’re in the second half so stick around and watch our amazing gymnasts and coaches flip out! TEAM TRYOUT! Interested in becoming part of our Competition Team? Tryouts are Saturday Dec. 1 from 12-1 PM at Rob Gym on the UCSB Campus. Call or email if you would like to sign up. Great Compulsory Season Comes to an End. Congratulations to Spirals 2018 Compulsory gymnasts. For many this was their first year ever competing. We ended the year with all the girls showing great improvement and several personal records at State. Well done coaches and girls!! Spirals Compulsory Team Getting Ready for Championships! Our season is winding down for our Levels 2-4 team girls. We’ve has some great performances this season with everyone improving as the season has progressed. Stay tuned for State results for this talented group of girls. Fall Enrollment is happening NOW! Hurry to sign up as classes are beginning to fill up. We’d hate to have you miss your favorite class time! Call or visit our Classes tab to find your class. Spirals is performing at the Goleta Rotary Clubs 4th of July at Girsh Park! Come to the stage area and watch our team do a demo at 6 PM then stay for the live music and fireworks! > Spirals is now accepting Santa Barbara Axxess cards! >Visit the About Us page to see our gym closure dates! Support the program by donating through Pledgeling or PayPal!